Water lily pads. Reed frogs. A shy bushbuck coming down down for a drink. Leopard spoor leading into the mopane. The rhythmic slap-slapping of paddles. The satisfaction that comes with slightly sore muscles. Drink in hand, you wriggle your toes in the sandy riverbank. Papyrus heads bending in the breeze. A baby elephants suckles from its mother, her sisters standing protectively nearby. A feeling of deep solitude, deep peace. An intimate gathering. A time of renewal. An adventure you will remember. The Selinda Adventure Trail is a 5-day adventure along the Selinda Spillway – the waterway that links Botswana’s Okavango Delta with the Linyanti and Kwando water systems. The canoe trail harkens back to the spirit of safaris of old, when days were spent on impromptu exploration and nights were spent camping along the banks of a river. Today, the Selinda Canoe Trail offers this is unique safari adventure in Botswana – 5 days spent traversing the remote and pristine Selinda Spillway waterway, with impromptu exploration and bush walks and camping under the stars in tents on secluded islands. The trail leaders are very experienced and qualified wildlife guides. The high rains of the 2009 wet season resulted in epic floodwaters. For the first time in nearly three decades, the Selinda Spillway flowed in full, connecting these two ancient waterways. Then, the ample rains of the first half of 2010 and 2011 ensured that the Selinda Spillway continued to flow. The headwaters met again in early May 2010, three months earlier than in 2009, and even earlier the following year in March 2011. 2012 was just as bountiful, with earlier departure dates announced. The trail begins roughly 45 kilometres downstream from Selinda Camp, northeast of the Okavango Delta. We explore the Selinda Spillway eastward following this meandering route through the 320,000-acre Selinda Reserve. We complete the journey close to the convergence of the Linyanti and Kwando waterways. The five day / four night Selinda Adventure Trail offers new and exciting elements either a canoeing adventure or a pure, guided walking safari along the Selinda Spillway. Each day begins in the early morning after a hearty breakfast and when the Spillway is at its most peaceful. Walking is an integral component of both canoeing/ walking trail and naturally the pure-walking trail experience, and it is now more extensive to allow for access to new islands and lagoons. Even when you are on a canoe safari, each day can include walking experiences of up to four hours to investigate areas of regular predator activity or wildlife sightings. In addition if there happens to be wildlife activity that warrants investigation whilst canoeing, we stop on the banks and take a short walk into the bush. Brunch is taken around mid-morning and light snacks are available throughout the day for sustenance until dinner. At night, the deep silence is punctuated by nocturnal sounds, from croaking frogs to roaring lion or the hyeana’s whooping call. The atmosphere is magical and the highlight of any African safari. On the last morning of the Adventure Trail, we finish at our Selinda Explorers Camp before transferring you back to the Selinda Airstrip for your onward departure. Ideally you could and should elect to stay on for an additional night or two at either Selinda Explorers Camp, Selinda Camp or Zarafa and Dhow Suites. 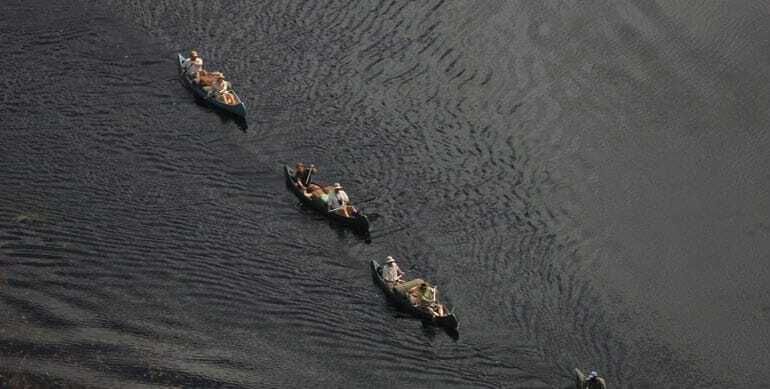 Since this canoe trail can be easily added to the front or back end of any safari to Botswana or nearby countries, transfer costs will be added once we have a better handle on your other plans.